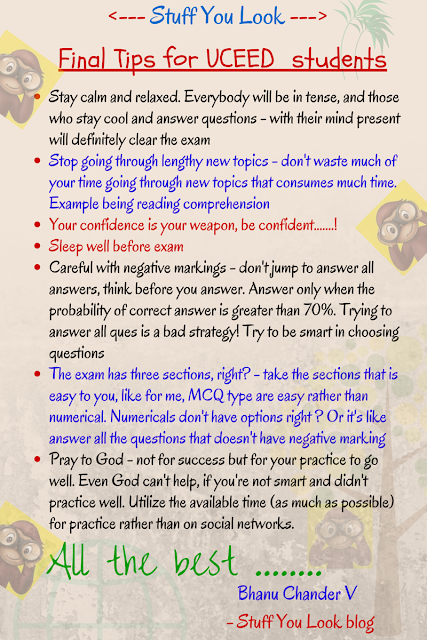 Last minute tips for UCEED 2016 exam! Tips for UCEED last minute preparation are same for every year. However I would like to add some more points including the some that I shared with NID guys. UCEED topics are vast, so if you keep on searching for topics (say for a single question) then you are lost in an ocean of huge web resource, so utilise whatever time left specifically to revise the so far learnt or referred topics and also whatever topics you have saved for last day study. Don't overburden yourself by over stuffing your brain with too much info in a short span. Make sure that you can remember them if you do so. Otherwise there might be chances that you might forget what you know very well. Basic math recap and so on. Forget about MCQ, MSQ or NAT, since the questions carry negative marking, so the only thing you have to make sure is to check whether your proposed answer is confident enough or not! Your answer should be more than 70% probability of being correct, then only think about answering them. Most people, despite of attempting many questions and because of not caring for negatives loose their marks. So, whatever the question type is (like I mentioned above), just make sure your response is good and all your experimental answers have highest chances of being correct! Take the section which you feel is easy to you at the beginning. If your initial/beginning attempts are like it gives positive satisfaction to you, then hurray ........... You will attempt rest questions with confident even if you don't know them! Be confident. That is the only tool/armour you have. A well-prepared person with less confident might have greater chances of losing marks! Like wise an average prepared guy with full confidence have the greater chance of being the topper! Mind the time during exam. Time management is very important in UCEED. Questions like reading comprehension, aptitude etc are time consuming but the good part is we can be more sure about the answers. GA questions are time savers - only if you are aware or heard about that; otherwise be careful in answering them! Don't get fooled by complex image questions. They look difficult to solve but in actual, they are quite similar like we solve normal geometric questions. If you have answered correctly during practice or mock tests, then don't hesitate to try them during exam even if it looks difficult! No need to carry art media like colours, pads, papers etc. Papers will be provided to you for rough works. Well, this time, the number of questions is only 80/85 for a total of 300 marks in 3 hrs. The lowest negative and highest positive mark fetching section is MSQ type, but it's not that easy to justify the correct choices even if you can figure out one or two. Advantage with MCQ is that we are pretty sure that only one choice is correct but again due to more similar choices, it can be tricky. So, better if you don't start with both the sections (B and C). NAT type has no choices but are straight forward, in fact if NAT questions comes with choices, then it would be confusing. So, better start with NAT I.e for section A. Then like I said, attempting Section C (MCQ) is advantageous - if not in full, but at least some questions before you switch to Section B (MSQ). Then finally go to MSQ. As always be careful with negatives and your answering confidence level! On an average, spend 1.5-2 minutes for each question, regardless of marks. Spare at least 15-20 minutes at the end to recheck your attempted questions. This is very important and might help you avoid mistakes - only if you are left with time!! That's it, I don't want you to spend time much on reading this. You better revise your topics. I never really comment on blogs and such, but I really feel the need to commend your work. 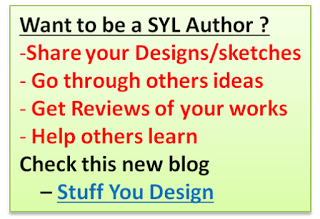 The resources you're providing on this blog are immensely helpful. And not only that, you are also quite encouraging, something a lot of us aspirants appreciate a lot. Thanks a lot again! Thank you all for the love. Thanks for your blessings, sir. Thank u all for enjoying the tips. thank u sir!! for this blog was the only material I had for UCEED!! !